From busy city streets in Los Angeles to quiet back roads in Gloucester, MA, they seem to be everywhere. 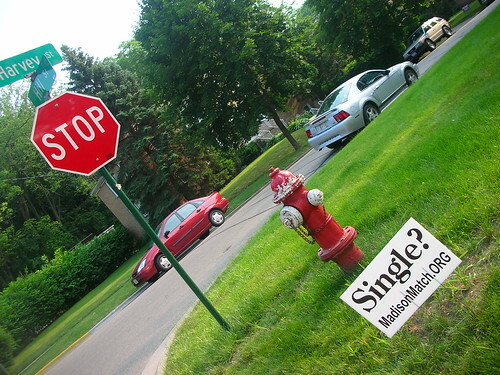 And yet each one refers the viewer to an impossibly niche dating site, targeted at a particular town or neighborhood. What’s the deal with these signs, where do they come from, and what’s the business model behind this whole enterprise? Well, it’s time to rise and applaud the efforts of Mr. Robert J. Moore, author of THE METRICS SYSTEM blog, who did the spadework to find out the details. Tormented by visions of these signs throughout Jersey, he began to research the source of the signs and found a nationwide company that specializes in ripping people off and littering our towns!! * Dating sites are known for tremendously high churn rates (if your product works, your customers never have to come back; if it doesn’t they see no reason to come back). This means dating sites have to keep a steady flow of new customers coming into the top of the funnel in order to survive, let alone grow revenue and profit. * High churn rates mean new customers have low, volatile expected lifetime values. This has a negative impact on the equity value of each customer, making it difficult to justify the valuation multiples seen by membership-driven websites in other verticals. * The need to keep more and more new customers coming in creates a necessity for massive marketing budgets that often involve aggressive affiliate marketing (i.e. paying third parties to bring you new customers). This further damages the perceived value of the user base to a potential investor or acquirer. * Like social networking, “online dating” is a natural monopoly (or, at best, a natural oligopoly). A dating site’s quality is determined by the number and quality of matches it can provide a new user, which is directly tied to the size of its membership base. This makes it extremely difficult to enter the market. However, just because something isn’t a great investment prospect doesn’t mean it’s a bad business. Many, many people have become obscenely wealthy in this industry (both online and offline). The technology required to connect two people is trivial, meaning your only real expense is the cost of customer acquisition. If you are part of the natural oligopoly, your product quality will be high and people will seek you out. This cycle lowers your costs and sends your margins skyrocketing. Furthermore, the online dating industry has made a lot of secondary players wealthy thanks to affiliate marketing. At times, online dating sites have paid as much as $100 per head for new paying customers, and routinely pay out at least a few dollars for new “free trial” users or other prospects. This means anyone with the power to herd single internet users can potentially tap into a strong monetization engine. Diving into the data, Moore googled up all the info he could find, relentlessly ran WHOIS searches, purchased publicly-available domain registration data, Excel-macro’d his way to the truth, and finally tracked down the mothership. This company is also exceptionally successful. Inc. magazine and Boston Business Journal have noted the company’s rapid growth and strong profitability. Remember when I said that certain dating businesses can print money? This is one of them. A 2006 press release reveals that the company was then bringing in about $45 Million of revenue a year. I also found an unverified claim from a disgruntled ex-employee on ripoffreport.com that claims the company charges their customers from $3,000 to over $15,000 for their matchmaking services. At those prices, the economics of the yard sign strategy start to make sense. Yard signs like those cost about $1 apiece to print and if franchise office has a slow day they can send out their extra “relationships experts” to plant lawn signs within a 50-mile radius. One successful new lead can bankroll thousands of new signs. In the end, I consider this mystery solved. My years-long fascination with these bizarre signs that seemed to follow me up and down the east coast is over. As a bonus, I discovered an interesting company with an even more interesting marketing strategy. Regardless of how you feel about Together Dating’s industry or its methods, you have to appreciate their tremendous, low-profile marketing machine and the data-driven technological infrastructure that supports it. This company brings in 8 solid figures of revenue every year using nothing but yard signs, some parked domains, and a firm grasp of the data that drives their growth. CEO Paul Falzone explained the importance of such data in a recent interview. And we might add that regardless of how you feel about this sign-planting operation, you have to appreciate Robert Moore for figuring it all out and explaining why it makes sense. Read his entire blog posting here, and if you think you might have use for his numba-krunching and metric wisdom, you can hit up his services here.